Happy Monday peeps! How was the weekend? As mentioned, I worked a bit on staging a client's home, partied a bit (hooray for a babysitter) and even brunched a bit with the lil man and the ladies. Anywho, back to business! Today we're thrilled to have a sponsored post from Rustico Tile and Stone, a leading online retailer of natural stone tiles, at wholesale prices to boot. Since a huge chunk of our design projects are kitchen and bathroom renovations, we spend countless hours sourcing new tiles. Rustico Tile and Stone have some pretty stunning tile options. Let's check out their post on how to create a stunning bathroom. Have you ever walked into a gallery space and been drawn in by a mixed media exhibit that seemed discordant at first glance but overall created a harmonious theme? 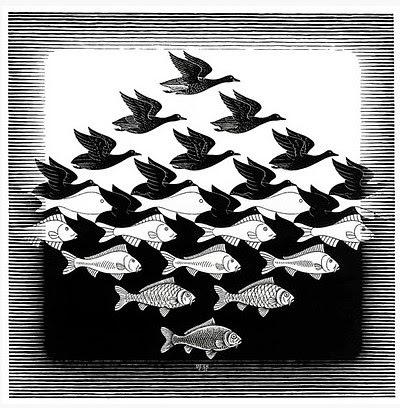 Have you ever seen a monochromatic palette that creates an illusion of things disappearing or blending? These are just a couple optical treats that great art can play on your senses. 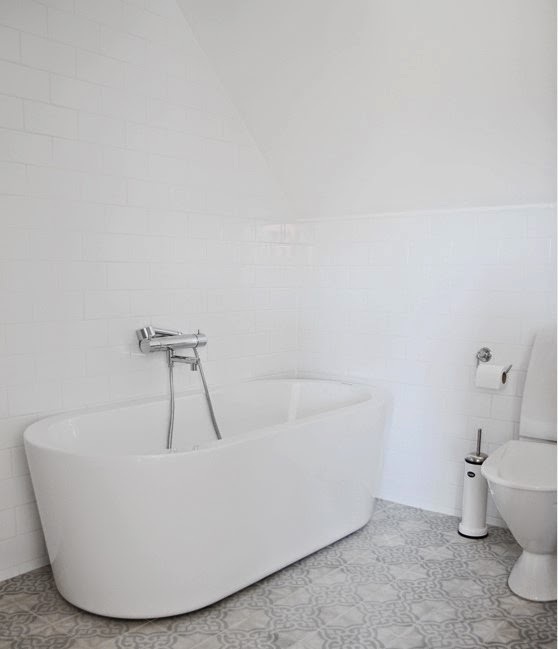 What if you incorporated the use of cement tiles into your bathroom to create optical treats and designed a space that literally became a functional work of art? Different patterns on the walls and the floor reminiscent of an MC Escher drawing. You are initially drawn in by discord but upon further observation begin to see harmony in the striking contrasts. This shower room/bathroom reminds me of the art of Saul Bass, arguably the worlds greatest graphic designer. He designed everything from movie posters to corporate logos and lots in between. Clean lines, bold color, unmistakably graphic. Below is one of Saul Bass’s matchbook designs. Can’t you just see it on the wall in this room? How clever would it be to stencil the tile pattern onto a simple curtain, or silk screened onto paper and framed? Or just painted onto the wall itself? 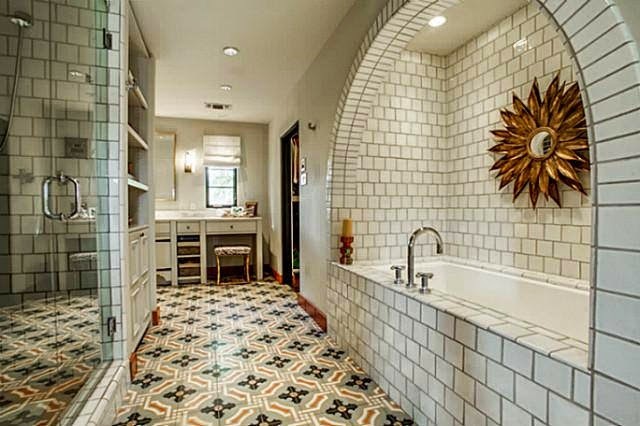 This would turn a cement tile pattern into an entire theme for your bathroom. 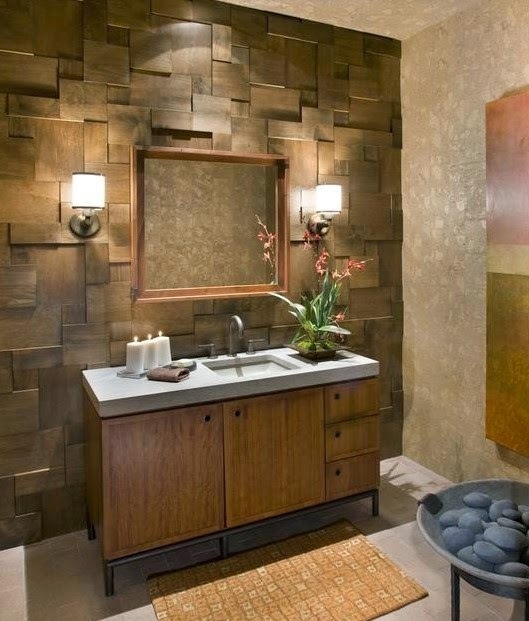 This idea creates the illusion of the fixtures actually receding into the wall. 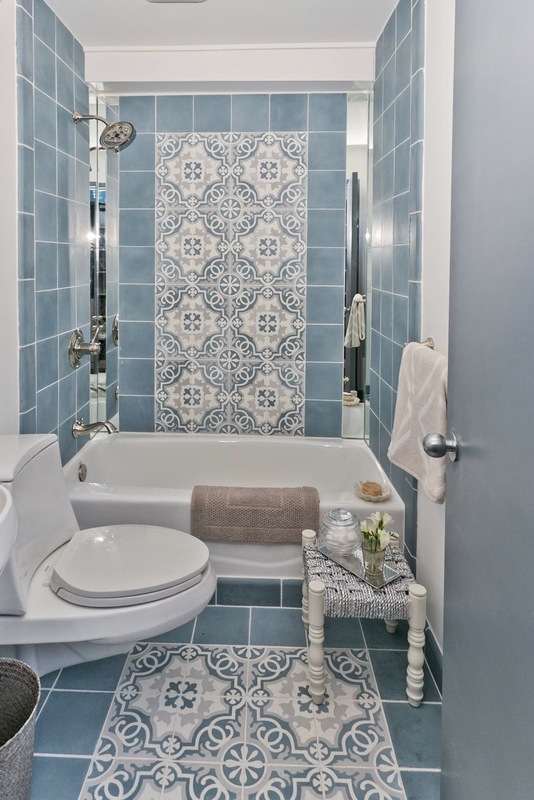 This would work with any color but I think white fixtures and walls with striking grey cement tiles look modern and create a bold “gallery” effect. Texture in tile was used heavily as Tin ceilings which originated in the 1880s as an affordable way for people to dress up a room's fifth wall. 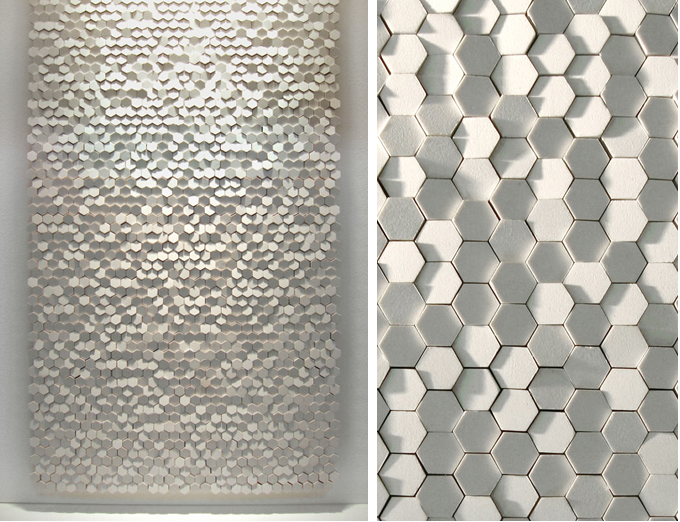 Textured tile seems to be popping up all over bathrooms and kitchens lately - from textured backsplashes to whole walls exploding with geometric textured design. Texture makes an undeniable artistic statement, so why not try it out in the smallest room in your house to make the biggest impression? 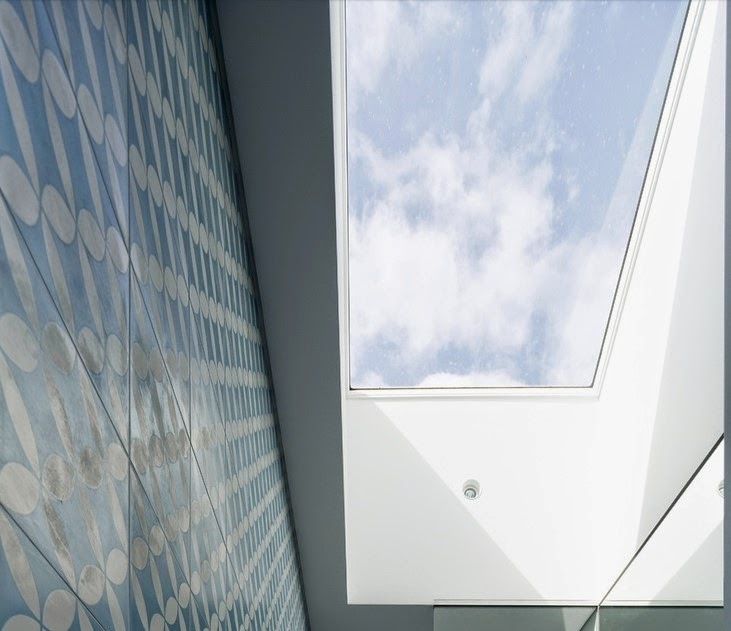 These clever folks used an open skylight to play with their interior design concept by matching their tile on the wall to the sky above. A pleasing blue and white cement tile matches a partly cloudy day above. 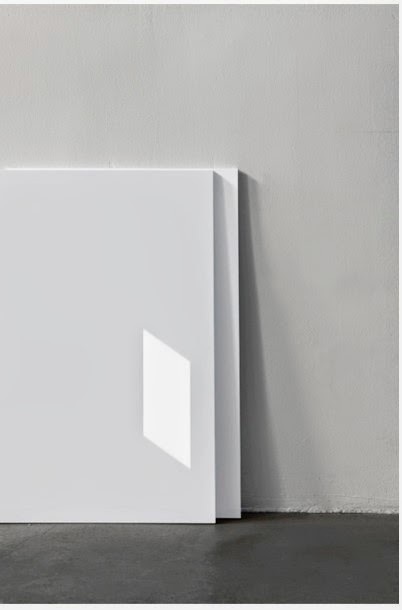 A cool concept that works on the wall because of the vertical design which draws the viewers eyes upward. 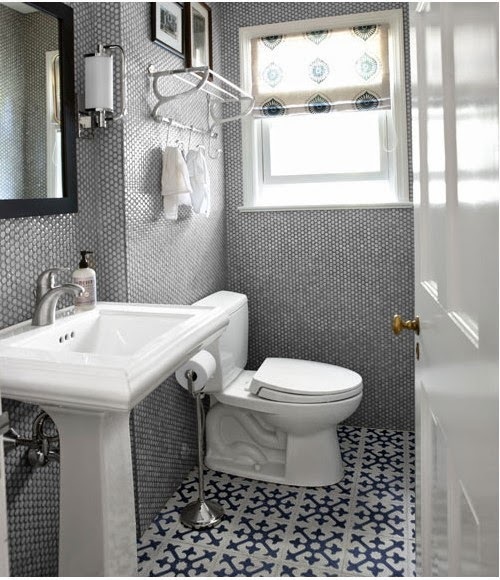 You don’t need a huge budget to incorporate tile into your bathroom and create your own functional masterpiece. You just need a good idea and one wall or floor! We hope this post has inspired you to check out Rustico Tile & Stone selection of cement tile and decorative tile at wholesale prices. 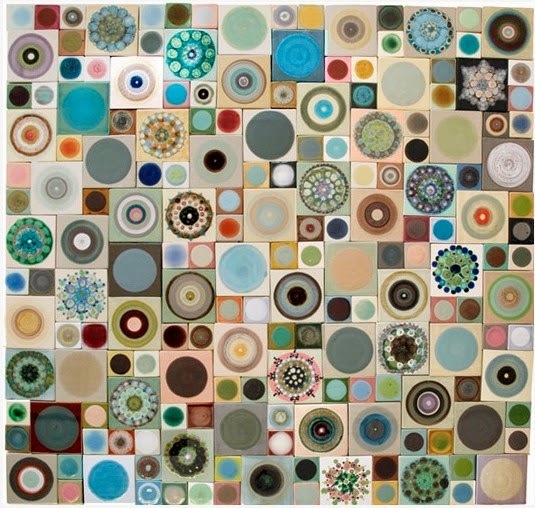 And do share updates/photos of tiles purchased for your own project so we can feature them here. Cheers to a great week! There are some exciting photos and ideas here!! 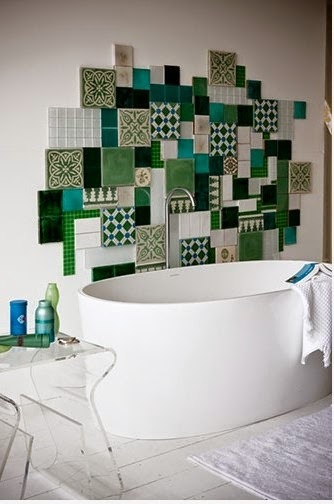 I love some fabulous tile! There are so many great designs now. Thank you for inspiration. 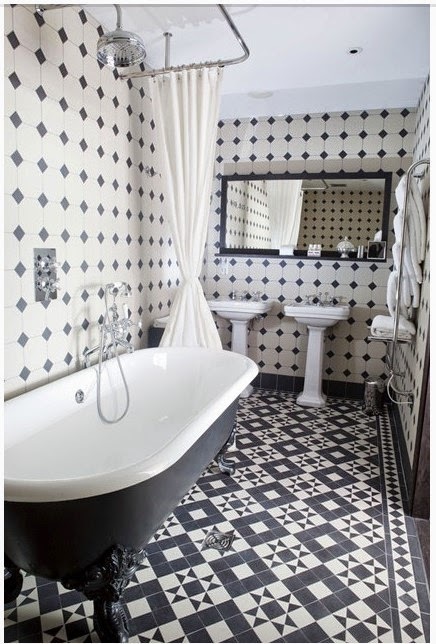 I like the bathroom with black and white tiles. Great design! 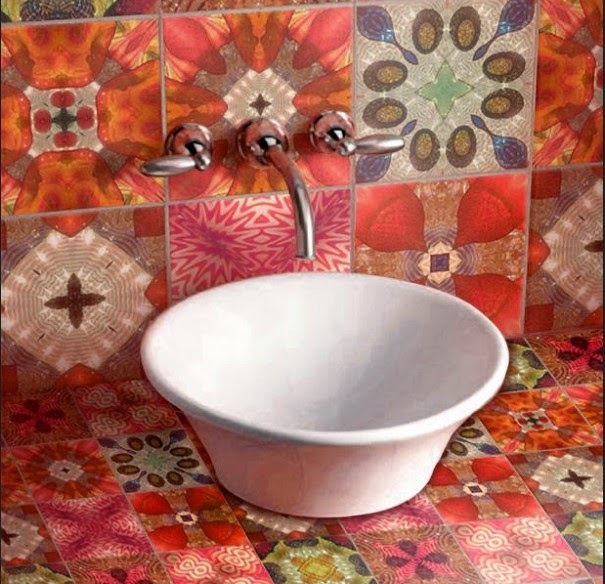 These bathroom tiles are cool adding texture to it and making it look live. One will really feel good seeing these. 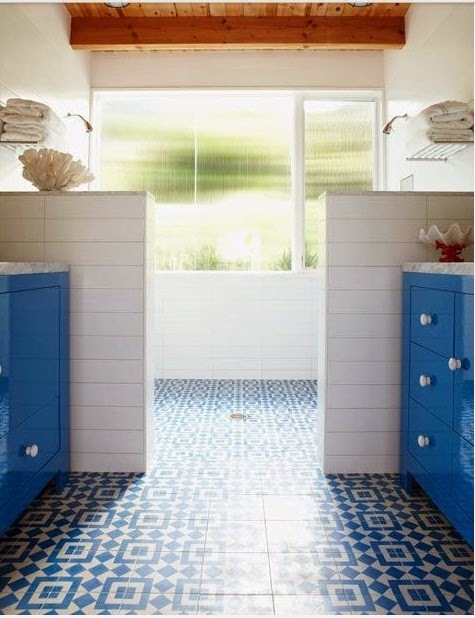 Especially the designs in which furniture’s and tiles are matching.